If you’ve arrived here, you’re probably doing your research while planning a fishing trip in the Florida Keys. I’m going to offer some advice from experiences fishing while fishing along side some of the Key’s most prestigious guides. 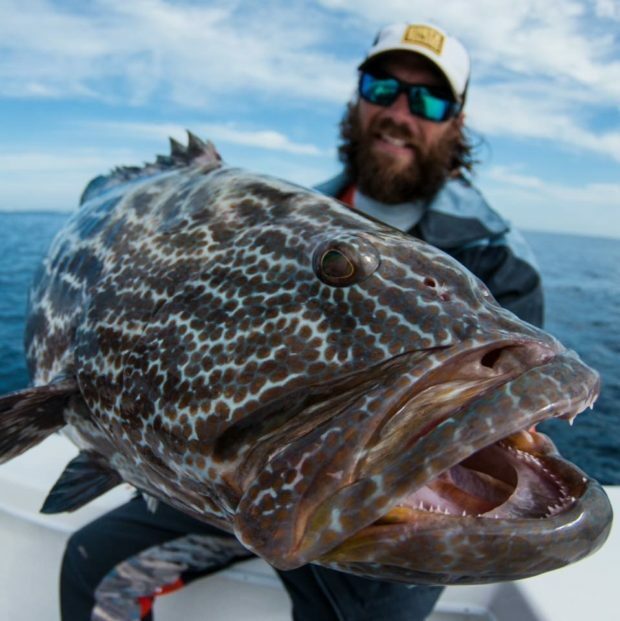 These tips, tricks and suggestions are certainly not the only way to plan for your trip, but I hope you can find tid-bits of information that help you plan and enjoy your time fishing. Now you may be headed down with a very specific species goal in mind, be it tarpon on the flats or tuna on the humps. While the best laid plans are always best, weather, wind and an off-seasonal migration can all throw a twist. This is why I like to plan for a certain species, but mentally be OK going with the flow and targeting what may be the best option that given week. This guide will help you lightly pack for a variety of species and situations. My personal favorite to target in the Keys. 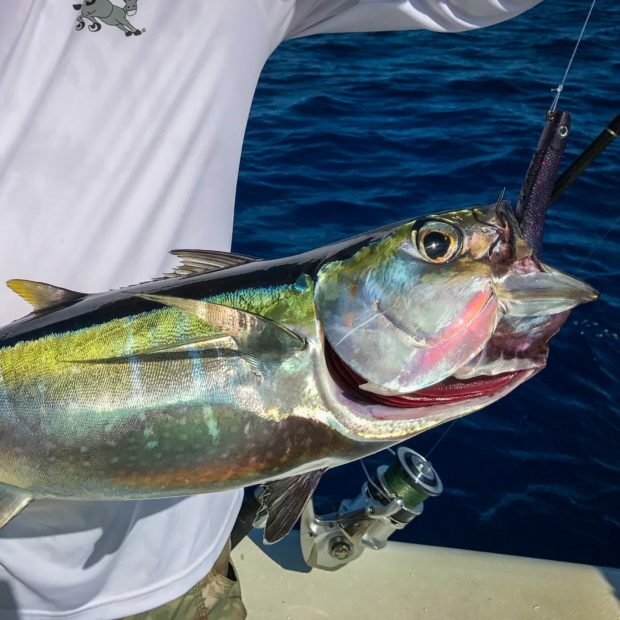 The Silver King can be caught with well presented lures in the right conditions. I choose to target them with a variety of Soft Plastic Lures. 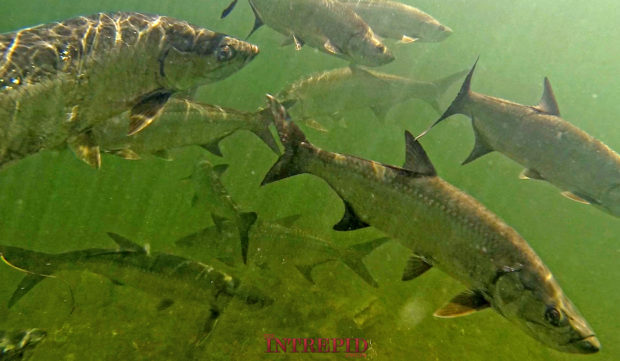 You’ll want two types of Soft Baits for tarpon – an Unweighted and Jig Head Weighted option will help you cover depths 2′ to 40′, where Tarpon often roam in the Spring and Summer. Unweighted: My go-to lure for tarpon in shallow water (less than six feet) is the Hogy 10inch Original Eel with an Un-Weighted 10/0 Barbarian Swim Bait Hook. This combination can be slowly twitched before laid up tarpon in shallow water. It’s delicate delivery is best suited for weary fish at close range. Weighted: Don’t limit yourself to fishing the flats, some fantastic tarpon fishing can be found around most Key’s Bridges and Channels. These areas have swifter current and deeper depths, requiring some weight to properly fish the water column. I like to keep it simple and throw Pre-Rigged weighted Pro Tail Eels and Paddle Tails. I’ll use 2oz and 3oz weights, adjusting the weight depending on depth and current. The top colors are Black Purple Flake and Bone/Glow. Both seem to work equally well during the day and evening, while the Black Purple Flake excels after the sun goes down. The backbone meat fish of the Florida Keys. Snappers and various grunts are abundant and excellent table fare. 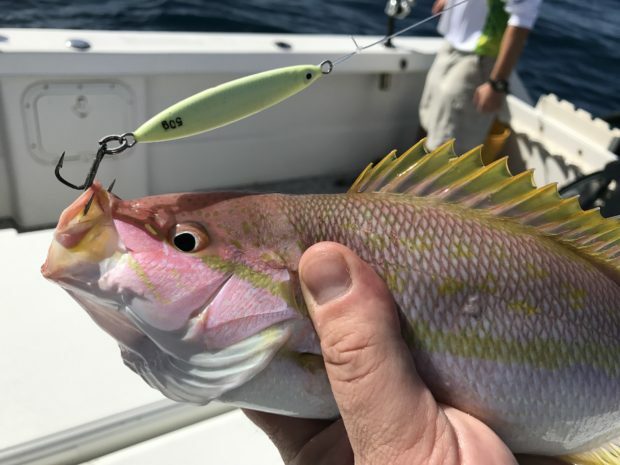 If you’re planning on catching and cooking your own meal in the Keys, snapper are going to be your best bet feeding yourself and others. A quick look through a local nautical chart or GPS/Chartplotter will reveal wrecks, reefs and other fishing areas. A vast majority of these will hold Yellowtail, Mangrove, Lane and other Snapper species. There is no doubt that traditional chumming and light tackle live bait fishing works fantastic, you may want to spice things up and get some action on lures. Small metal jigs ranging 3/4oz – 2oz in the 2.5inch – 4inch range are fantastic at jigging up dinner. My favorite is the 1.75oz Hogy Squinnow Jig. It’s a small 3inch Jig that weighs in at 1.75oz. This combination of heavy weight and small size is ideal for fishing in 12′ to 100′ depths. 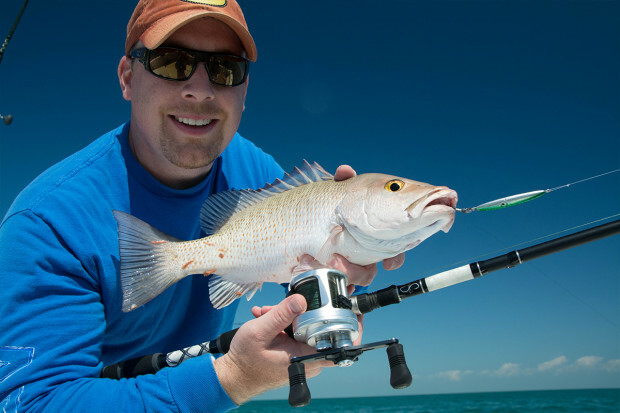 A do-all jig and catches just about everything swimming around the reefs, it’s my top choice when you need to keep rods bent. Simple to fish, the Squinnow Jig should be fished on medium weight spinning gear, 20lb braided main line and a 4′ – 6′ 25lb Fluorocarbon Leader. Pitch the jig away from the boat, let it sink toward the bottom, while paying attention on the drop as many strikes happen on the fall. Once it hits bottom, use a medium speed jigging action to hop the jig back towards the boat. That’s it. 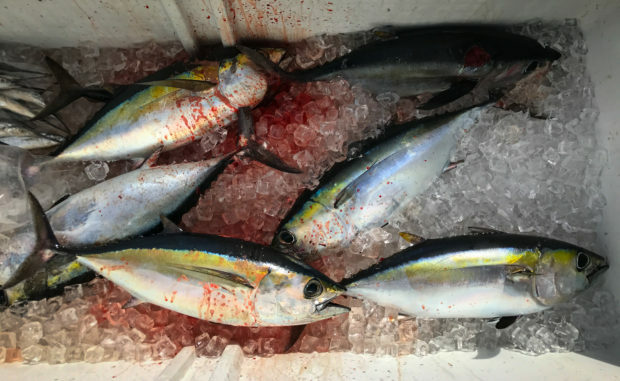 Fantastic Blackfin Tuna fishing lies just a few miles out past the reef. Their depth and abundance changes with the seasons, but these basic lure techniques have proven to be effective year-round. Trolling: There’s a wide variety of trolling methods for both Tuna. I’ll cover a technique that uses a lure that can be trolled and casted on offshore spinning tackle. The 7inch 1.75oz Pro Tail Eel really came to shine on a recent tip to Marathon fishing with Two Conch’s Charters on the humps. Blackfin tuna were spread out and finicky. Casting: My personal favorite way to hook up on blitzing tuna is casting metal jigs into the fray. The exact same 1.75oz Squinnow Jig recommended for snapper fishing is deadly on Blackfin Tuna as well. Cast the jig on the outside edges of a blitz, let the jig sink 3-6 seconds and begin a fast, steady retrieve back. Hang on! Strikes can be jarring.